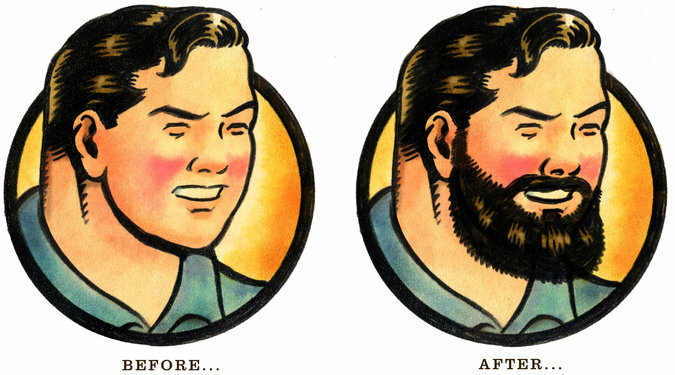 Today the NY Times did a nice article on facial hair transplants. They quoted me and one of my patients. Unfortunately they stated that the donor hair for his procedure came from his scalp (which is most commonly used in these procedures). But in actuality this patient’s donor hair came from his neck beard hair. This is because the patient no longer possessed any additional donor hair from his scalp because he had received prior procedures to treat scalp balding from another physician and his donor scalp hair was depleted in the process. Regardless it was an informative article and I was honored to be included. Below is the link and a copy of the text. Jose Armos, 28, a paramedic who lives in Miami, looked so young that, when responding to 911 calls, he seemed to add to some patients’ distress. Earlier this year, Mr. Armos visited the Miami office of Dr. Jeffrey S. Epstein, a hair restoration surgeon. “I wanted that stronger, manlier look,” Mr. Armos said. He had a full beard transplant, from sideburns to chin, at a cost of about $7,000. More than a thousand individual hair follicles were harvested from the back of his head, where hair grows thickest, and transplanted to his face. “It does play a role in me looking more mature, more manly, and just kind of getting respect from people,” Mr. Armos said. Dr. Epstein, who has offices in Miami and Manhattan, performed four or five facial hair transplants annually a decade ago. Now, he said, the average is three a week. According to the International Society of Hair Restoration Surgery, a nonprofit medical association, beard transplants grew from 1.5 percent of all hair restoration procedures performed internationally in 2012 to 3.7 percent in 2014. A beard transplant was not possible then because the procedure would have left the patient with a cobblestoned complexion. Today, surgeons, whether working on a scalp or face, transplant single hair follicles instead of plugs of 15 of them. That means more natural-looking beards, which can be shaved and then regrown, just as with regular beards . Dr. Marc Dauer, a hair transplant surgeon in Los Angeles, said that five years ago he performed about five beard transplants in a year. Now he does that many in a month. Phira, 33, who works in talent management in Los Angeles, went to see Dr. Dauer last December because of the large patches on his cheeks where no whiskers grew. “It looked like I had facial-hair leprosy or something,” said Phira, who had the spots filled in with follicles transplanted from the back of his scalp at a cost of roughly $4,000. Ray, 53, who works at a Pittsburgh university, said he had always looked forward to growing a beard, from as young as age 12. But whiskers never appeared on his cheeks. After his first procedure, in 2011, Ray wanted his beard to be denser and climb higher up his cheeks. He had a second transplant in 2012, from another hair restoration specialist, Dr. Glenn Charles, who practices in Boca Raton, Fla. In 2013 Ray returned to Dr. Charles for a third go-round. Total cost: $22,000.